What bustles to life in the African bush once the sun sets and the stars dot the sky? For me, a game drive into Africa’s darkness is full of excitement and every corner holds a promise of the undiscovered. Teaching wildlife photography in South Africa, I actively push for night drives. 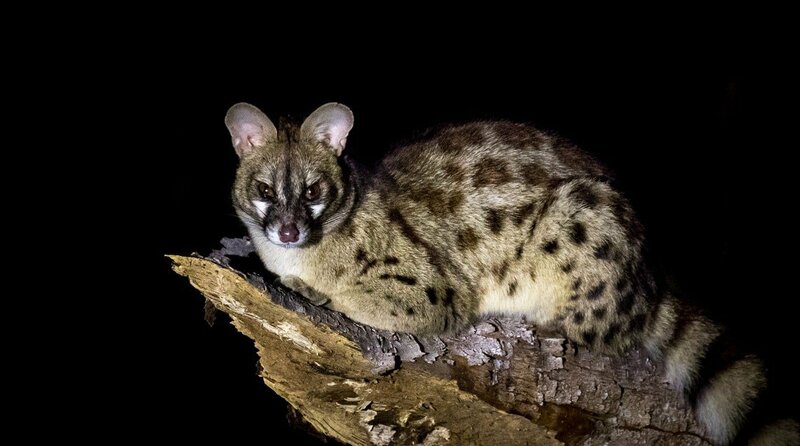 When diurnal species like impala and zebra settle down for a night’s rest, nocturnal creatures such as nightjars, scrub hares, spotted thick-knees, genets, civets and aardvark take centre stage. Suddenly the African wilderness takes on a new and refreshing form – the beauty of unpredictability and the unknown, all hidden by a veil of darkness. Night-time brings its own perks. After sunset, chances of hyena and leopard activity sky rocket, and there’s the visceral pleasure of driving under Africa’s blanket of stars. 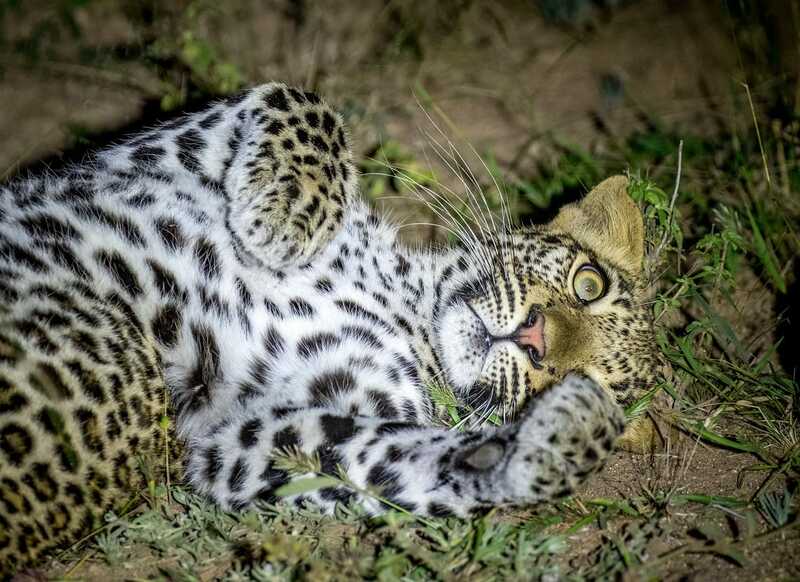 Imagine spotting an elusive leopard or rare aardvark without knowing how to successfully capture your long-awaited sighting… Photographing wildlife with limited to no light is challenging, and knowledge is key. Bombarding wildlife with multiple and harsh light devices is highly discouraged. Although flash guns have their benefits, I’ve garnered infinitely more positive and pleasant experiences without them. Naturally, your ISO is going to be uncomfortably high, but with technology ever improving, low light functionality in cameras can easily handle this. A flash emitting from the top of your camera will result in a horribly bland and flat image, but a spotlight from a slightly different angle can result in something truly spectacular. 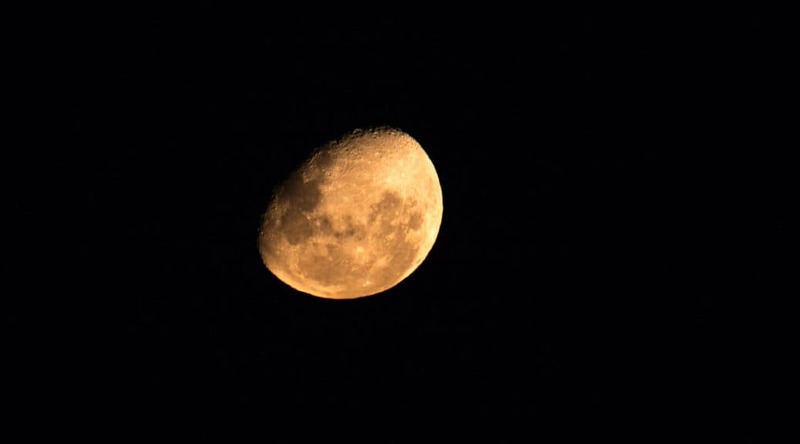 Ambient light, such as a full moon, can be used to good effect, provided you have a still subject and a tripod at hand to eradicate movement. Making use of a remote shutter is also a clever technique to avoid movement. A lot of professional guiding companies and lodges use spotlights – they’re fantastic for spotting animals (you’re looking for reflecting eye-shine) due to their power and scope. However, with great power comes great responsibility. 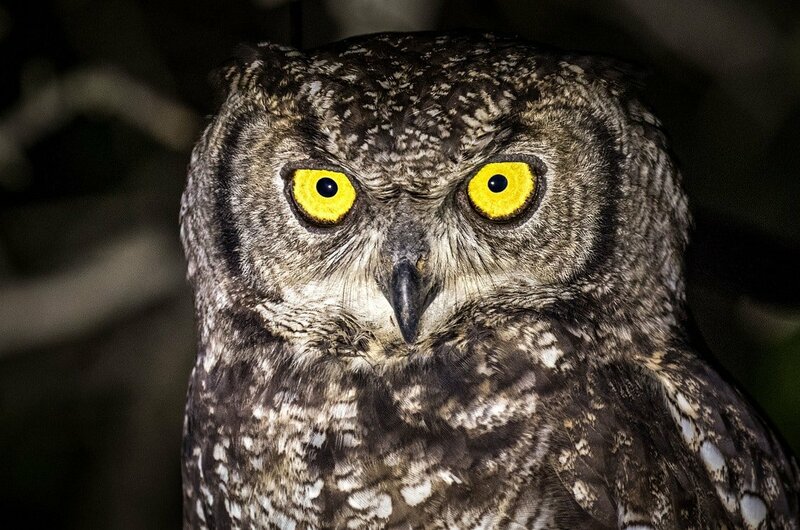 With nocturnal animals we want to make sure we’re not directly pointing these strong lights into eyes. Usually red filters are provided with spotlights when purchasing and these can be clipped on to reduce any negative effect on animals at close range. When this leopard cub started blissfully rolling around next to a very relaxed mum, I jumped at the opportunity. We used the spotlight from another vehicle to light from the side. It’s imperative to remember not to disrupt animal behaviour. As desperate as you might be to want to light up a prowling leopard, this may put the cat at a huge disadvantage if it’s on the hunt as any nearby prey will easily spot the predator. Once again, it’s about putting the animals first and making sure we’re in no way overstepping our boundaries. Shouldn’t a night drive be a pleasant experience for both visitors and wildlife? 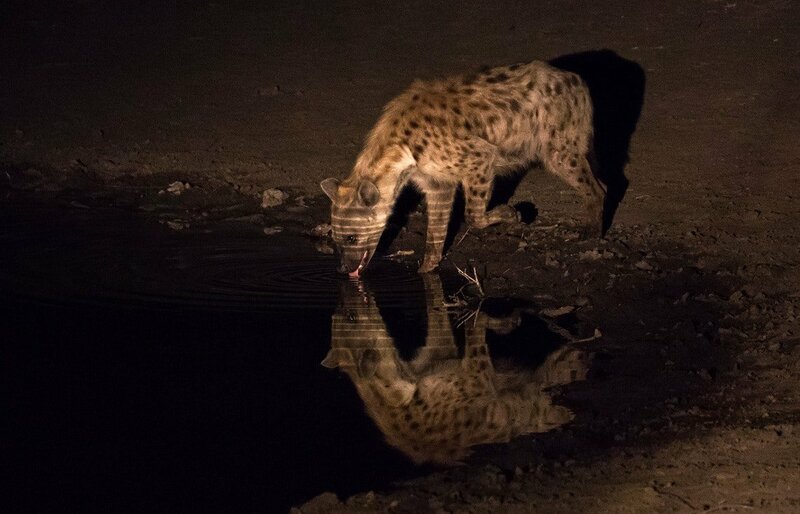 Although this spotted hyena was some distance away, we directed the spotlight onto the water to help illuminate the pattern of the water on the hyena’s face. With software like Adobe Lightroom you can play in the editing process by lowering and raising highlights to balance out the final picture. The closer you are to your subject, the more light will reach the camera’s sensor, enabling it to effectively capture what’s in front of the lens. 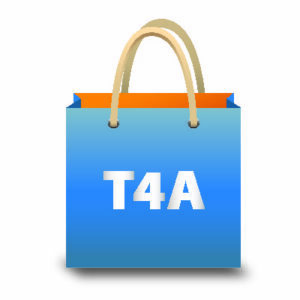 This produces an end product with more quality and detail. Move closer if the animal will tolerate it, bearing in mind different animals have different flight distances. Even though this giant spotted eagle-owl allowed us to slowly approach to a very close proximity, we still had to keep our movements and noise levels to an absolute minimum. Being noisy or restless is never advantageous and at night there’s all the more reason to remain still. 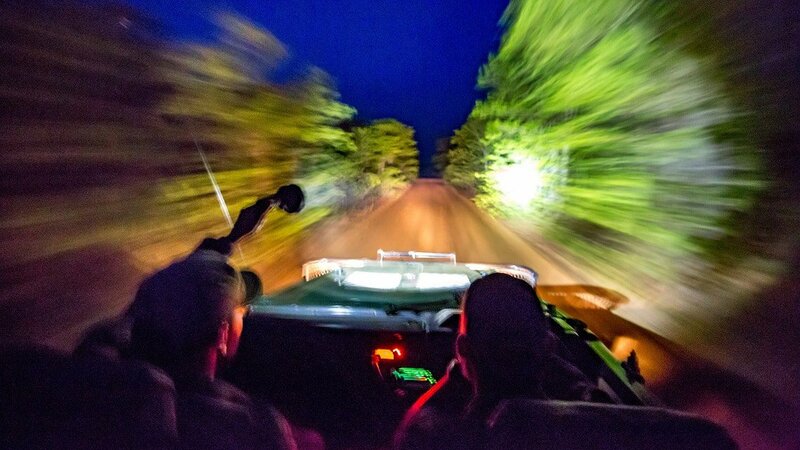 Due to slow shutter speeds, the slightest rocking of the vehicle can completely ruin your shot. Genets are very difficult to capture as more often than not they’re constantly on the move. On this occasion we set out in the early morning instead of the usual evening to see if we found any differences in behaviour. We came across this small spotted genet as it looked to be finding a spot to settle down for the day.